Spinach is THEE most nutritious and healthful veggie that one could consume. Spinach is rich in breath enhancing chlorophyll, vitamins A, C, K, and E, folic acid, and the minerals of magnesium, manganese, calcium, potassium, and iron. Spinach is also rich in the mineral lutein which is beneficial for the eyes and for the prevention of eye problems like glaucoma. Spinach is also a great source of omega 3 fatty acids. Spinach has everything! You can get more information on the health benefits of spinach Here. Popeye was on to something when he got really strong and energized from eating it, LOL. Spinach is also a great source of protein too. I used to watch a lot of Popeye and Olive Oil when I was younger. Now I love to eat Spinach and olive oil together, LOL. I never liked Spinach when I was growing up but I know from consuming it awhile now that Spinach is a nutritious veggie that does not taste like a vegetable. You want to consume spinach raw to get the full spectrum of nutrients and also buy it organic as Spinach is one of the crops where high levels of pesticides are used when it is grown non-organically. The list of crops that have high amounts of pesticides used when grown non-organically is called the Dirty Dozen. Spinach has a really neutral taste and this makes it great for adding into salads or even smoothies. See recipes below. Add spinach, tomatoes, carrots, almonds and cranberries into a large bowl. Season with a pinch of salt, paprika, and cayenne. Set aside. Then combine olive oil and lemon juice into a smaller bowl and then add to salad. Toss to combine. Enjoy! That salad will fill you up and load you up on nutrient dense calories that will leave you satiated and not craving another meal in 2 hours. The almonds are packed with good fats and the cranberries are rich in anti-oxidants. You can jazz up your salad any way you like by adding more veggies (mushrooms, green peppers, etc). This recipe can be a template that you can use. I personally like just adding olive oil and lemon juice on my salad but you can use an organic salad dressing. Try to avoid commercial salad dressings loaded with sugar (high fructose corn syrup) and unhealthy rancid omega 6 oils like corn or soy. Now I will give you a really simple way to incorporate this extremely healthy veggie into your diet. I will give you a smoothie recipe with spinach in it. This is a great way to get children eat this vegetable. You might not want to call it a "Spinach smoothie" though. Add all ingredients to a blender and then add water. Blend for about 30 seconds to a minute. Enjoy! 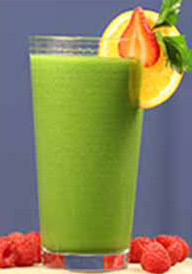 This smoothie can be a nutritious breakfast or meal that you can enjoy during the midday. You can also jazz up this smoothie recipe as you like to. You can add some cold-pressed flax oil and maybe even some hemp seed protein to make it a "protein shake". Be creative. Schedule a consultation with me and receive the highest quality health information on the planet so you can be perfectly healthy! I have been a holistic health researcher for the past 8 years and my specialties include how to cure and prevent disease, nutrition, natural remedies, and holistic weight loss. I am also an Emotional Freedom Technique and this amazing, fast, and highly effective acupressure technique can be successfully resolve for any health, emotional, or physical issue on the planet. EFT works within minutes and works where nothing else does! Schedule your appointment today by clicking here! I am eating this salad right now and it is DELICIOUS!! Thank you Curtis for sharing the recipe.